Designed by Hoffar and launched in 1929 at Hoffar-Beeching boatyard in Vancouver, B.C. Deerleap is 85' long. She is powered by two Gardner diesels. Curtent homeport, Port Orchard, Washington. Deerleap was built in Vancouver, British Columbia, by the Hoffar-Beeching Shipyard for Colonel McLimont, the president of Winnipeg Power and Light. 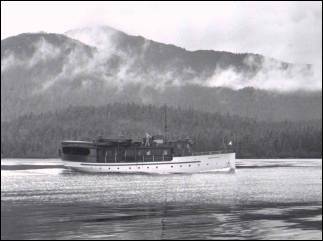 McLimont wanted exceptional viewing capabilities aboard a comfortable and elegant cruiser, built specifically for excursions to Alaska. 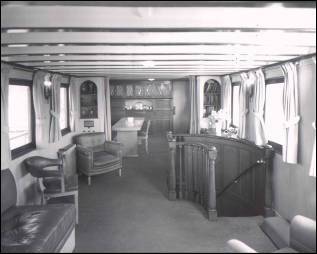 Deerleap's original design, which remains intact today, included a large combination observation saloon and formal dining room on the main deck, with French doors opening to a spacious covered aft deck. 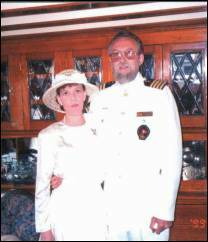 The lower deck encompassed crew quarters forward, a master stateroom amidships, and guest staterooms abaft the owner's cabin. 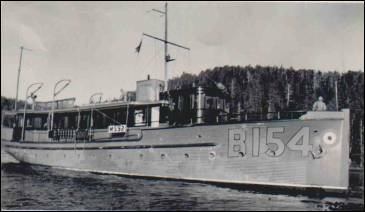 McLimont used the boat extensively to cruise the Inside Passage with private hunting and fishing parties. 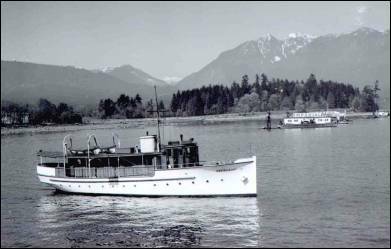 However, just five years after she was built, McLimont sold Deerleap to the owners of Vancouver's Spencer Department Stores, who kept the boat through the Great Depression years. 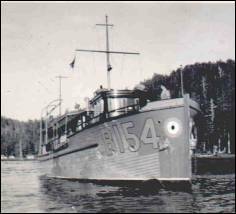 Then, like many Canadian and U.S. yachts of her day, Deerleap was conscripted during World War II, painted gray, and equipped with deck artillery. It was also during those years that the original Hall-Scott gasoline engines were replaced with 120 bhp Vivian diesels, reportedly weighing 7,800 pounds each. 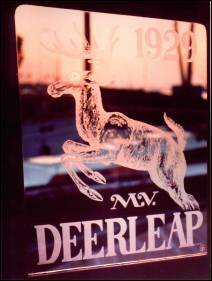 After World War II, Deerleap was purchased by Campbell Church Jr., a young, affluent Seattle mining engineer. 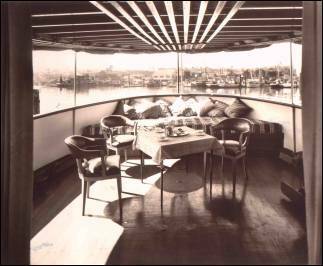 Church had started a yacht charter business that catered to wealthy sportsmen, and his fleet included such famous yachts of the day as the 86-foot Ted Geary-designed Westward; her sister ship, Caroline; Alician; and Seyelyn II. 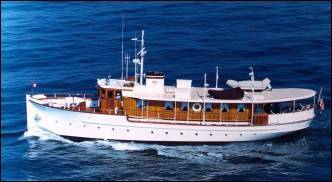 With her immense observation saloon and fantail aft deck, Deerleap was the perfect addition to Church's charter fleet. During the 1940s and 1950s, she frequently hosted entertainment luminaries including Bob Hope, Bing Crosby, and John Wayne, and financiers such as Andrew Mellon Jr. During the mid-1950s, Deerleap was sold to Bud and Alice Olson. In 1956, she reportedly ran aground in front of the Empress Hotel in Victoria and, in the winter of 1957, the boat sank to the bottom of the harbor in Port Angeles, Washington. 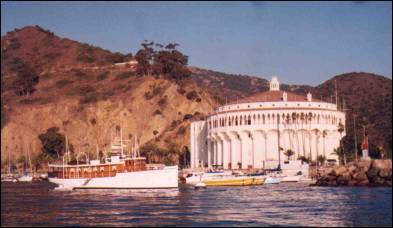 By the 1960s, Deerleap was in Southern California, once again serving as a charter vessel, hosting the Kennedy family and various movie stars, and frequently being contracted as a floating set for Hollywood movies. However, the boat changed owners frequently and, by the late 1980s, she had fallen into disrepair and was put up for auction. 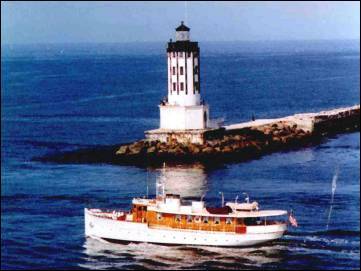 Richard ("Slim") and Carolyn Gardner had been introduced to Deerleap when friends invited them aboard for a weekend excursion to Catalina Island. "We'd been the owners of a 65-foot commuter boat called Old Age. We had the boat for fourteen years, but it had an outside steering station." Slim grew tired of always being outside in the weather running the boat while his guests sat below in warmth and comfort. "I knew the minute I walked aboard Deerleap she was the boat I wanted," Slim says. "Her pilothouse, although raised, is still completely open to the formal dining room." This feature was important because it allowed him to operate the boat and visit with company at the same time. "Once she went up for auction," Slim says, "it became a real legal mess. Because the boat is documented, the title was actually owned by the U.S. government, and it controlled the boat until all legal matters were settled. Meanwhile, she sat unattended for four long years." A complete list of renovations and repairs to the boat would be too long to compile. At one time, her teak house had been painted white, which had to be stripped so the brightwork could be returned to varnish. The ceilings of the cabins had been painted and covered with plywood, which was removed so the beams could be stripped and varnished. Finally, by the late 1990s--after thousands of hours, dollars, and units of human energy--Deerleap was ready to begin her historic voyage north, back to the same waters she traveled during the 1920s and 1930s. The one aspect of the Deerleap Slim enjoys and respects more than any other is her seaworthiness. "I've had the boat lying completely on her sides along the coast of Oregon and I never doubted her for a moment. She was built to go anywhere in any conditions." "Her Roaring Twenties charm has always attracted me,"Carolyn adds. "It's that, more than anything else, that I think is missing in boats today." After many years in Southern California, Deerleap now calls Port Orchard, Washington home. Wooden boat enthusiasts can see her firsthand at many of the Classic Yacht Association rendezvous in the Pacific Northwest. Like many Canadian and U.S. yachts of her day, Deerleap was conscripted during World War II, painted gray, and equipped with deck artillery. It was also during those years that the original Hall-Scott gasoline engines were replaced with 120 bhp Vivian diesels, reportedly weighing 7,800 pounds each.